It bears the signature flavor to your table. With it’s creamy consistency and balanced flavor, slightly sweet, with an adequate touch of acidity to give a special flavor to your food, such as salads or use it to marinate fish or birds. With the same quality as our traditional Passion Fruit vinaigrette but with a lighter twist, to keep you in shape and help you eat healthy. Cesar Dressing is the perfect touch to enjoy a delicious salad. Cesar, with its naturally based ingredients: From our world class parmesan cheese to the incorporation of anchovies. A delicious touch of Venezuelan flavor, ready to include in all of your dishes to transform them into truly exquisite meals. The sweet flavors of Japan, right at your fingertips. 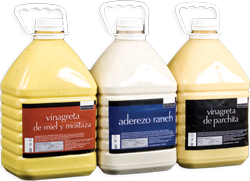 Our delicious ranch dressing adapts perfectly to our tropical pallet by lowering slightly the traditional bitterness creating an exquisite dressing! All the flavor of France right at your table. Each drop is an explosion of flavor in your mouth! An exquisite sauce with a delicate spice touch, ready to be added to your foods. Delicious sauce ready to serve to lovers that have a fiery pallet! With its creamy consistency and a hint of sweetness, it’s an excellent choice to accompany a salad or to use as a dip. The delicious flavor of all natural peaches to create truly unique dishes. This Orinoquian BBQ version is differentiated by its light delicate flavor. The taste of Asia brought to you in a unique and elegant style! Our company counts on up to date installations and equipment to package products in an individual format, also known as personal dose or sachets.